Did you know a simple and easy way to protect your family is to clean your air ducts? Without cleaning them you will create an environment that is ideal for fungi, mold, allergens, and bacteria. Do you know where your air duct is? A majority of air ducts are located in the basement. This area of the house tends to create more moisture, which can lead to the build up of mold. This issue needs to be addressed so that mold and mildew can be properly cleaned. We love our furry friends! But if we do not stay on top of it their fur can get trapped in our air ducts. This will cause reactions with peoples allergies. The systems function will improve after removing the hair. Ever wonder where its all coming from? You can dust everyday and to find dust everywhere again the next day. Without proper cleaning of air ducts the dust will keep circulating around the house. New homes will be purchased with dust in the air ducts purely from all the construction and drywall. Everything in today’s world is about being efficient. So why should your HVAC work any different? Cleaning out hair, dust and so many other pollutants allowing it to work more efficiently. 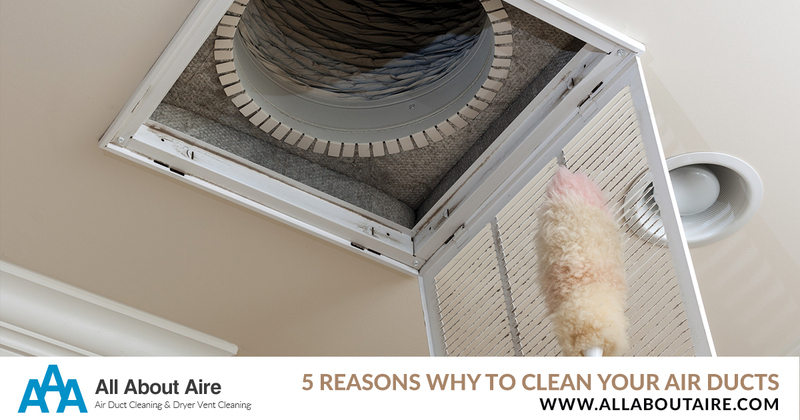 Contact All About Aire today by email or call us at (864) 400-8229 to schedule your air duct cleaning appointment.